Keep reading and enter to win below! 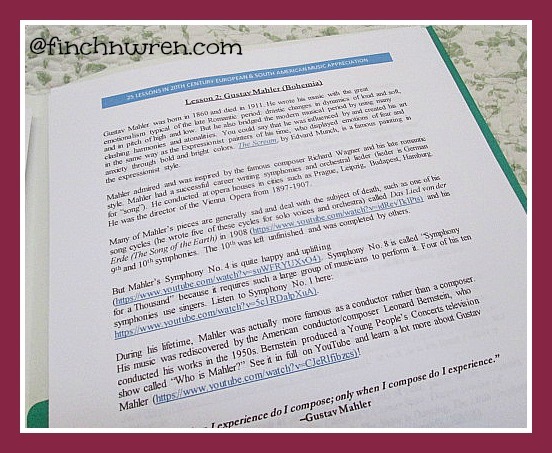 Last fall, I had the privilege of reviewing Gena Mayo’s wonderful curriculum, 21 Lessons in 20th Century American Music Appreciation Course. My son and I thoroughly enjoyed the course. And this year, Gena has published another fantastic course, this time teaching about music from two other continents: 25 Lessons in 20th Century European & South American Music Appreciation. I’m excited to share this course, and our experiences, with you. And Gena is even providing one lucky reader with his or her very own copy of this curriculum…plus a discount code for you to use if you don’t win! What is 25 Lesson s in 20th Century European & South American Music Appreciation? Gena Mayo is a trained musician who’s also the homeschooling mother of eight children. She teaches her own children as well as others in homeschool coop classes. Gena and I “met” while serving on the TOS Review Crew, when I discovered that not only did Gena review homeschool curricula well, she also wrote delightful and user-friendly music appreciation curricula! Her latest, 25 Lessons in 20th Century European & South American Music Appreciation, provides homeschoolers (whether they’re musically-trained…or especially, if they’re not) with a wonderful resource to teach about the dramatic and fascinating musical movements and changes of the 20th century. and even the British invasion! How does this curriculum work…do I need to be a musician to teach it? Now, perhaps that list seems intimidating. How would you even know what to teach about these composers; what is important about them; and how would you go about finding examples of their best works and compositions? 25 Lessons in 20th Century European & South American Music Appreciation could easily be used in either a coop class or at home with just a few students. It can be used for all ages, and can provide 1/2 credit when taught to high school students. The curriculum even includes an excellent appendix, full of links to great music sites, additional books or other music resources, a list of further composers to study, and excellent notebooking pages for music observation. Gena even includes short descriptions of various music theory here and there! I love the questions that the author answers–and asks–with this curriculum. What is impressionistic music–and how does it connect with the art movement of impressionism? How did national identity influence a composer? Did a composer write both music and words to an opera—and why, or why not? Because of her extensive musical training, Gena knows and shares information that the average (unmusical) person might not think to ask. We began with Puccini, whose contributions were primarily in the world of opera. Two of the three Puccini performances Gena linked to were incredibly familiar to me (and I didn’t even enjoy opera, until recently! ); however, if I’d had to tell you their names I’d have failed utterly. The performances were—and I’m really not exaggerating here—sublime. I wasn’t personally looking forward to hearing Gustav Mahler’s work; I really hadn’t enjoyed much of what I’d heard of his over the years. Was I ever surprised to discover that he did actually compose some beautiful, uplifting music! And then, there was Debussy. And Sibelius; a hymn you might never have known he composed. And then, a lovely section on musical theater, featuring the compositions of Lloyd Webber, Tim Rice, and others. And, so much more! The links feature everything from historical presentations, to symphonies, to single arias…even a Google Doodle. The range of talent and type, even above the musical performances themselves, keep a student’s interest level and enjoyment high. My son and I had very different reactions to the various musicians presented in this course; while we both just loved hearing the presentations and learning about the musicians, we preferred different types of music. And Gena included so many! I have a choral background; Jackson has never been interested in choir but has played piano for years and enjoys orchestral and piano music primarily. So I adored the vocal performances (I’d never have imagined that I’d come to appreciate opera), while he thoroughly enjoys the symphonic and orchestral. Yet regardless of our preferences, we were exposed to the wide range of musical styles and movements of the 20th century, from European and South American artists. If you’ve been looking for a genuinely wonderful music appreciation course–that you yourself can teach–look no further! Where can you purchase this? 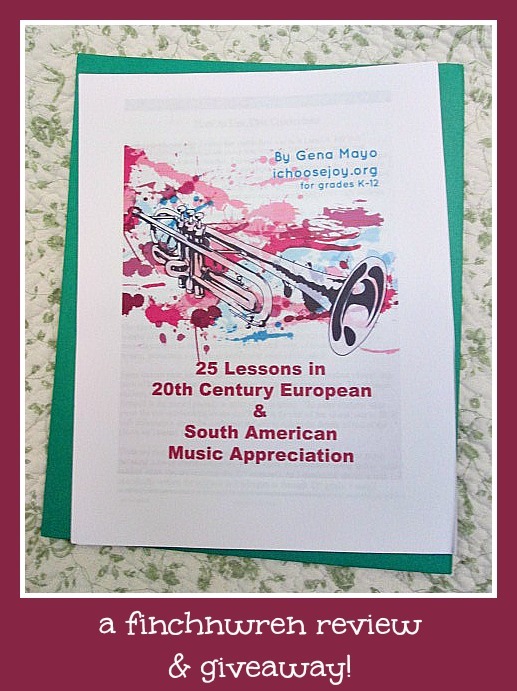 Gena Mayo has provided one copy of 25 Lessons in 20th Century European & South American Music Appreciation, that one reader will be blessed with! Simply enter the Giveaway Tools entry form below for your chance to win. Giveaway closes on Friday, September 30, 2016. Disclaimer: From time to time, finchnwren may receive a free product or service in exchange for our honest opinions expressed in our blog. We are not required to write a positive or glowing review, nor are we additionally compensated for these reviews. We share our own opinions, and our family’s opinion, of these products. We’re disclosing this in accordance with FTC regulations. Hello! 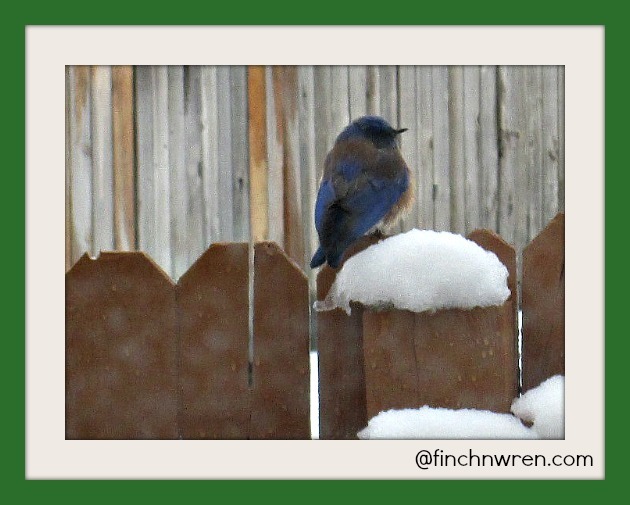 I’m Wren from the FINCHNWREN blog. Here, you’ll find me writing about books, homeschool, giveaways, fun and life. I’m so glad you stopped by!